Crossing the finishing line at the CRUK Relay for Life in Wigtown. Kirriemuir woman Rhona Guild has completed an incredible solo cycle ride around Scotland to raise funds for Cancer Research UK. As vice chair and secretary of CRUK Relay for Life Kirriemuir, she covered 812 miles covering a route which linked all the Relay for Life sites. Rhona with a group of supporters at CRUK Relay for Life Peterhead. During her epic challenge between August 16 and 24 she took in Kirriemuir, Dundee, Arbroath, Peterhead, Thurso, Perth, Dalgety Bay, East Kilbride and Wigton, raising over £6000 in the process. As well as raising funds Rhona also set out to raise awareness of Relay for Life in the hope that other Scottish towns/regions may become involved in what is an amazing community event. 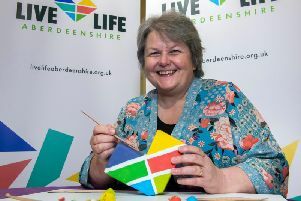 She also wanted to raise awareness of cancer and of raising funds to support the world class research taking place across Scotland and the UK, and to encourage activity and highlight the role lifestyle choices play with regards the risk of developing cancer. Rhona said: “I wanted to take on a big enough challenge that would capture people’s attention. Rhona with Ian Angus in Arbroath. “Although a regular, albeit slow, cyclist and runner, I did not start cycling until well into my 40s. Rhona has been involved in Relay for Life in Kirriemuir since its inception in 2007; she is passionate about the event and the role it plays in both supporting people affected by cancer, encouraging people to talk about cancer and raising the funds CRUK so badly needs as it relies completely on public donations. She continued: “Like most people, I have had family and close friends affected by cancer, giving me cause both to ride in remembrance and celebration. “In every site I was met with a very warm welcome and have gained lots of ideas for Kirriemuir’s next Relay in 2017. ‘‘Wigtown arranged their cheque presentation evening for my arrival on completion of the ride, so we had a wonderful double celebration. “I felt very privileged to be part of their celebrations. “The ride was a greater challenge than I anticipated, but a wonderful experience that I will be boring people with the details of for a long time to come. Donations can still be made via Rhona’s Just Giving page.